April's Little Corner: What Men Want is FANTASTIC!!! What Men Want is FANTASTIC!!! A few weeks ago I was feeling stressed out by work, weather, and family and decided I needed a "Self Love" day. I took myself out to a matinee movie. 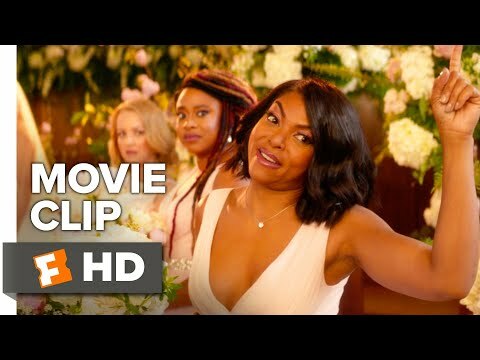 I love Taraji P. Henson and romantic comedies so it seemed like a perfect fit. I got the largest tub of popcorn with extra butter and a giant cherry soda ( my guilty pleasure) then settled in to the newly remodeled reclining (and heated) chair at the AMC theater and prepared to be entertained. I know a lot of people think it's weird to go out to eat or to a movie alone but I don't mind it at all. The best part of going to see this movie in the middle of the work day was that there were only about 5 other people in the ENTIRE theater. This movie was freaking funny! Ali Davis ( Henson) is a woman in the male dominated sports agent business. She has worked twice as hard to be successful as her male coworkers but she keeps getting passed by for a partnership. Her best friend is getting married and in honor of her last night of freedom they decide to have psychic readings done before they hit the club. The psychic (played by Erykah Badu) tells Ali that until she truly understands what men want she will never get her promotion. FYI... Erykah Badu was my second favorite character in this whole movie. She was awesome. Anyways, Ali ends up getting a little to turnt at the club, hits her head, and wakes up with the ability to hear men's thoughts. The rest of the movie is just amazing. Watching Ali try to land the biggest deal of her life while balancing a new relationship and her powers is comic genius. This movie has something for everyone so fellas don't think of this as a chick flick or you will miss out on Tracy Morgan and all the other amazing men that make up the cast. I will be adding this to my home library for sure when it drops. Well, let's see... I am a Mom. This is the most important thing in my world. I love to laugh and spend time with my family and friends. Traveling is something I wish I could do it more often. I am a foodie. I could watch cooking shows all day long!!! I'm still new to this whole blogging world but it is inspiring. I am always available for movie or book reviews or even guest posts if anyone is interested.